The “Yellow Vests” movement was unexpected. It started as a spontaneous discontent triggered by a new tax on fuel. Various fears and resentments suddenly converged on a series of disparate social demands cemented by distrust against Emmanuel Macron, “the president of the wealthy”. At first sight, it looked like usual French politics. Since 1995, all French presidents (J. Chirac, N. Sarkozy, F. Hollande) endured a dramatic drop of their popularity within 6 months after election. Their reforms were wrecked by leftist social movements, inner division of their majority in Parliament… and bad luck, that is depressed economic conditions. After his unexpected election, Macron seemed in a better position than his predecessors: had he not put an end to the rise of populism in Europe? Had he not a clear mandate and the means and energy to implement his program of reforms? With him, not only France but EU had recovered a strong leadership. 18 months later Macron faces not only a violent rejection of his policies, but an even more violent rejection of his person. “Macron get out!” was the main slogan of “Yellow Vests”. Despite the weakening of the movement and 10,3 billions € of welfare expenditure, jeopardizing the economic recovery of France and of the Eurozone, disorders and urban violence are persisting. The president and beyond him every politician and any mode of political representation are targeted ever more aggressively. “Yellow Vests” claim to be the people, they express its will directly. For them, only such a filterless expression is legitimate. Their anger is so deep that it is not negotiable and does not need further justification. Repeated declarations of Macron and his ministers acknowledging “your anger is right” have no effect. Before the violent demonstration of December 1st on the Champs Elysées, one could wonder about the nature of the movement, given its spontaneous and “apolitical” appearance. Media were complacent, intellectuals divided: was it a democratic insurrection against oligarchy or a populist revolt eyeing to authoritarianism? a protest of the poorest people against growing inequalities, or of neglected rural territories against “wired” cities ? the last battle of endangered professions and regions unable to find their place in the new digital and robotic economy? a concern about the most painful reforms to come, notably on pensions? Such social and political factors may play, but there is more, and unfortunately it is not reassuring. RELATED ARTICLE: What’s wrong with values? Second, anger against Macron evolved in a watchword overshadowing all other demands: the “Citizen’s Initiative Referendum”. It sounds like participative democracy, but it is not: the main point of this referendum is not policy issues but the revocation of elected representatives. “Yellow Vests” want the referendum to be free from any legal or constitutional checking (for instance if it contradicts human rights or international obligations). It is not meant to empower civil society, but to give unlimited force to individualresentment. Publicly, “Yellow Vests” stay “apolitical” and avoid the divisive positions of their agenda, but on Facebook they endlessly repeat their hostility to EU, even promoting a “Frexit”, and give way without second thought the most extreme clichés against Jews, Migrants, George Soros, Free Masons, homosexuals, etc. Putin could not have dreamt better. Behind the “right anger”, fake news, conspiracy theories flourish, spread by overexcited social networks, with the help of Russian disinformation which created hundreds of fake “Yellow Vests” profiles on Facebook. Last, populism goes along with distrust of media and elites (“them”) and credulity to any hoax circulating on Facebook (“we”). Belief in conspiracy theories was already high in France like everywhere in Europe (see my article “Europe in wightlessness” in May 2018). The “Yellow Vests” movement brought it to Russian heights. The burglars who trashed the Arc de Triomphe and plundered luxury boutiques were in fact agitators hired by Macron, some of them were even policemen. Immediately after the attack in Strasbourg on December 11th, “Yellow Vests” leaders declared that it was in fact a plot staged by Macron to weaken the movement. Even after it was established that it was a terrorist attack, which killed 5 people, many “Yellow Vests” stuck to some conspiracy theory (“a highly suspicious coincidence”). “Anger” was from start the key word of the movement, but “rage” is more adequate, because anger is an articulate motive against something, calling for compensations etc., while fury is a blind emotion calling for revenge or scapegoating. “Civil war is inevitable” declared Christophe Chalençon on Christmas eve, supposedly a moderate leader of “Yellow Vests”! How Macron came to raise such hatred? He made mistakes, he was sometimes arrogant or casual, but far less than his predecessors, he made a lot of reforms at high speed, at the risk of frightening the people, but he followed scrupulously his program. Admittedly, this program revealed inconsistencies, reducing fiscal pressure on wages and business on one hand, creating new taxes on the other. Now, all this can explain unpopularity, not hatred. 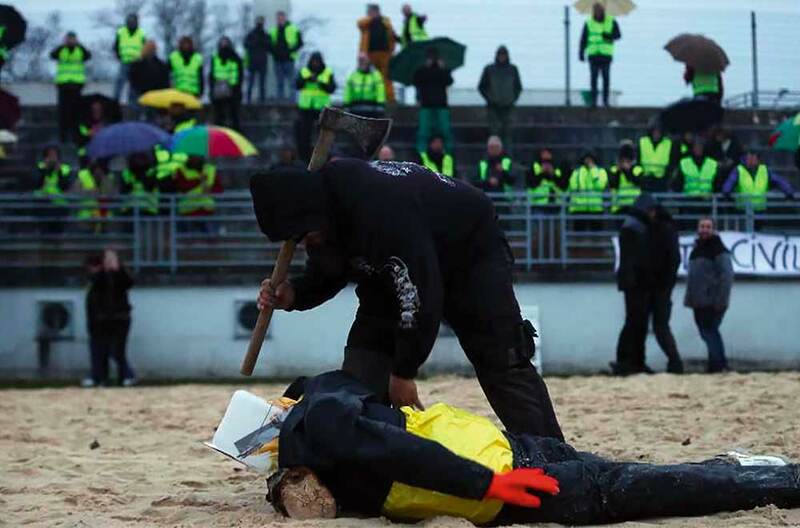 On December 22th, some “Yellow Vests” staged a fake public trial of Macron in a stadium, ending with the decapitation amid applause of a dummy featuring the president (see picture). Explanations lie in French politics, but also in global trends. Macron concentrates criticism because there is no political alternative in France. The political system collapsed in 2017, and no recomposition followed. Rather the two government parties declined further, meanwhile the neo-communist party La France Insoumise (LFI) failed to become the main opposition force, despite (or because of) the ambition of its charismatic leader Jean-Luc Mélenchon. Even Macron’s newborn party still do not exist on its own, neither in Parliament nor in the public debate. Therefore, the president is responsible for everything. The Far Right is the only party which survived on the ruins of the party system, and the only one benefiting from the “Yellow Vests” movement: Far Right voting intentions at the European elections (in May 2019) had reached already 26% in September (against 20% for Macron’s party, LREM). In December, thanks to the movement, Far Right jumps at 32%, while LREM is at 19%. But Far Right is not credible because it has nothing to offer, except leaving EU and the Eurozone, a perspective rejected even by those who are mad against “Brussels”. Marine Le Pen rakes support among “Yellow Vests” without saying much. 18 months after her pathetic performance at the presidential election, she is back in the game and just hasto whisper the operative word: “Yellow Vests”are “the Forgotten”. Meanwhile the vocal support of LFI brings it nothing despite the inflammatory declaration of its leaders (it is worth quoting François Ruffin, a LFI’s MP who declared in front of the presidency: “The president and no one else is slashing and burning our country, tearing apart our republic, M. Macron must go now, either by car, helicopter or scooter, he must go before our people become mad of rage”). Once a defence and hope against the dismantling of liberal democracy by Trump and Putin, Macron’s presidency leads into the trumpization of French society. The Constitution gives him time and stability until 2022, and he may have the historical dimension required to bounce back. But the politics of fury he is facing is not only French. From Washington to Warsaw, from Rome to Prague and Budapest, liberal democracy is threatened to death from the inside, to the satisfaction of the Kremlin. It is properly a tragedy: The politics of fury pretends to give power back to the nations, but its success would leave them powerless and precipitate what it wants to fight. However weak and unable to cope with the stakes and perils of the world, EU is the only shield of political freedom and safety for European nations. But unlike the French presidency, UE is vulnerable to coming elections. The outcome of a majority of populist anti-European parties in the European Parliament could be a collapse of the Union. I can only find a twisted and tiny hope in the possibility for Macron to get in 2019, thanks to the fear provoked by the “Yellow Vests”, the authority in Europe he did not get by his ambitious propositions in 2017.